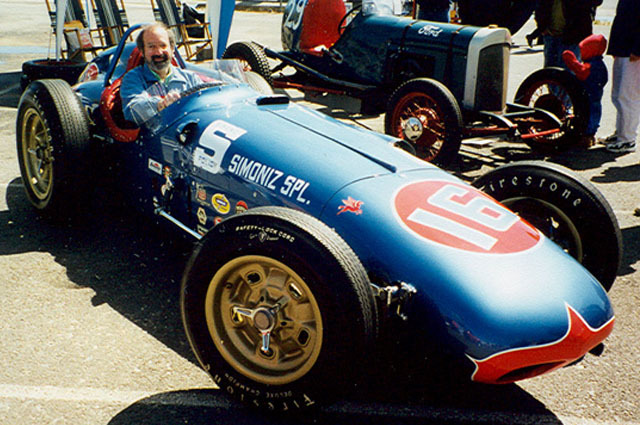 Howard saw and photographed the full-size car in 1999 at an SCCA-sponsored race car show in Gaithersburg, MD. The owner, retired Navy fighter pilot and Maryland resident Larry Pfitzenmaier, was thrilled by Howard's knowledge of the car. He happily answered questions, and even invited Howard to sit in the cockpit and snapped this picture. Larry's car has appeared in official Indianapolis Motor Speedway festivities, including parade laps at the Brickyard and has won "Best in Class' honors at the Pebble Beach Concours d'Elegance. It is one of the few genuine competition roadsters not in a museum -- Larry drives it in vintage races as often as he can.